City directories listed James and Thomas Hunter in business at 419 East 91st Street, New York City, from 1888 to 1899. James Hunter, "grate maker" and "iron," appeared in 1874. Thomas Hunter, "iron," appeared in 1879. These young gentlemen, Thomas, age 27, and James, age 24, appear in the 1880 U. S. Census, living with their father and mother, William and Margaret Hunter, at 341 West 41st Street, Manhattan. They were immigrants from Ireland, and their occupation was recorded as "iron railing." A younger brother, William, age 21, was also recorded as "iron railing." T. & J. 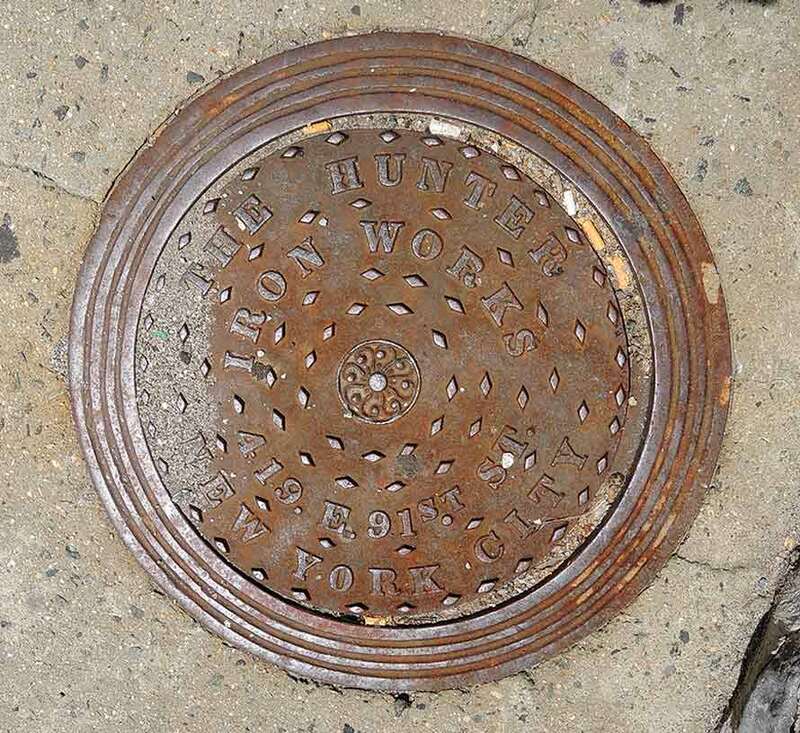 Hunter Iron Works were located at 1648 Second Avenue from 1884 to 1885, 1762 Second Avenue from 1886 to 1887, and 419 East 91st Street from 1888 to 1899. The 1897 Annual Report of the Factory Inspectors of the State of New York recorded Hunter Iron Works as employing 8 male adult employes and one under 18. The foundry, then, was a modest enterprise. A New York State death certificate indicates that Thomas Hunter (1853-1892) died 30 March 1892, age 38 years, 7 months and 2 days. This would work out to a birth date of 28 August 1853. The certificate says he had lived in New York City 27 years. This would mean he immigrated, age 11, in 1865. A death certificate for James Hunter (1856-1915) indicates that he died at age 59 when he lived at 7 5th Street, Long Island City, Queens. He had lived in New York 45 years. This would mean he immigrated, age 14, in 1870. The cause of death is recorded as "Delirium Tremens, Chronic Alcoholism, Acute Bronchitis."